Scotland finished their three-match Five Nations Under-18 Festival programme with a 45-24 defeat to England yesterday in Caerphilly. This was the second defeat to England this season, the young Scots having lost to the men in white 39-15 in a warm-up match at Stirling last month. The result means that the Scots finish the tournament having lost all three of their matches. 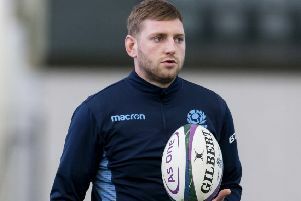 Scotland narrowly lost to the host country Wales in a 30-31 but the optimism from this game was snuffed out when the Scots suffered a 43-0 defeat to Ireland last Tuesday. Although defeated yesterday Scotland can take much the game, having won the second half after trailing 33-3 at the break. “We made a lot of mistakes in the first half and England were unforgiving. They punished us with five first-half tries,” said the Scotland Under-18 head coach, Ally Donaldson. But in the second half Scotland hit back effectively scoring tries by replacement scrum-half Harry Warr and flanker Calum Cruickshank (both Dollar Academy) and the Bath-based No.8 Dan Marek, all three converted by the Edinburgh Academy wing Ben Appleson, who also kicked a first-half penalty.